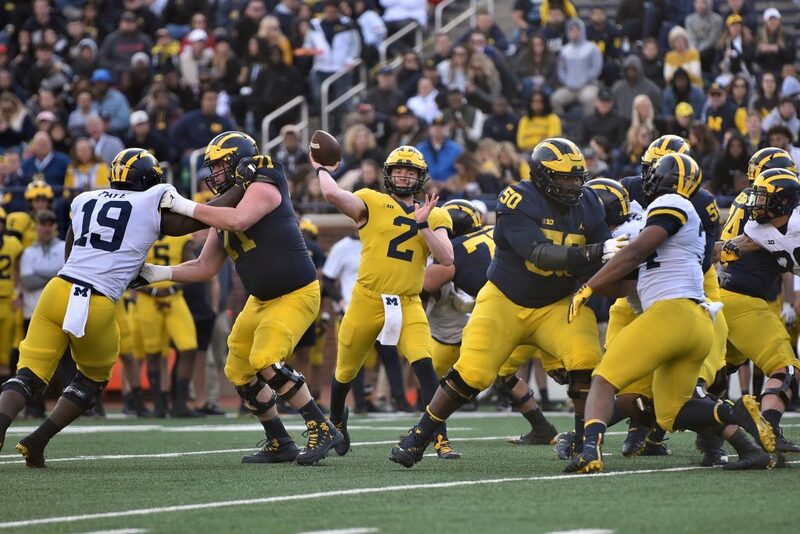 In what ended up being much more of a scrimmage than anyone expected, Michigan’s 2019 Spring Game Practice was a breath of fresh air for anyone that was hoping to see a new look offense. There was still a couple of under center/two-tight end sets but my biggest takeaway from the entire day was Josh Gattis’ willingness to air the ball out. Michigan quarterbacks threw the ball down the field (15+ yards) on almost every driver, several times on multiple drives. While the quarterbacks were a little long on most of the throws, there were a decent amount of connections for Shea Patterson, Dylan McCaffrey and Joe Milton. Really interested in seeing how the linebacker depth chart plays out. Love the speed from Hudson, McGrone, Gil, Anthony, Barrett, and Ross (who was out for practice). Shea Patterson looked good, had some nice passes and a couple overthrows but all in all, he showed how comfortable he was in the offense. Dylan McCaffrey’s best trait of the day was his legs. That could be an x-factor throughout the 2019 season as he knows how to find running room. Joe Milton is a NCAA Football make-your-own player creation. Big arm, big body, but still needs to work on his touch and his reads. Once he puts it all together, he’s going to be fun to watch. The hype around early enrollee WR Mike Sainristil was legit. He’s a problem. Not exactly Rondale Moore but will be a gamechanger for this slant happy offense. No idea what to think of the running back position with Tru Wilson and Ben VanSumeren getting the majority of the reps.
Erick All will be an impact player throughout his career. Ben Mason’s gonna have a Gameday special this year. Don’t take too much away from the defense’s complete performance with the majority of the scrimmage being two-hand touch, which doesn’t allow for the defensive players to truly make plays. The (Metro) Detroit trio at cornerback will be fun to watch, Ambry Thomas’ coverage was stellar all day and Vincent Gray definitely looks the part. When Lavert Hill returns, the position shouldn’t drop off much from 2018. Good to see a lot of slant routes. Need to get the offensive talent the ball as much as possible. J’Marick Woods is my pick for defensive breakout player of the 2019 season. Michael Barrett another name to watch out for as he continues to adjust to linebacker. I thought Andrew Steuber looked a bit crisper at right tackle but Jalen Mayfield flashes his high ceiling. Will be a battle throughout camp. Ben VanSumeren has a touch of Peyton Hillis in his game. Very interested to see how his game develops over the next couple of years. Good to see Quinn Nordin smooth a 39-yarder after dealing with the yips last year. Jake Moody showed off his consistently, meaning the kicking game should be in great shape. There were plenty of other takeaways from the day. Let us know what you thought of Michigan’s 2019 spring scrimmage? What was your first impression of Josh Gattis’ offense? Let us know in the comment section below!